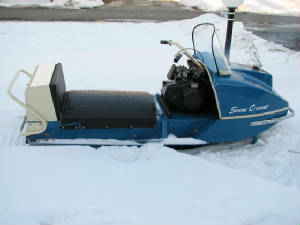 Dave Jamieson's beautifully restored 66 Snow Cruiser. 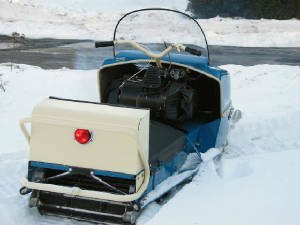 Its a model C-2060 powered by a OMC 2 cycle opposed twin making 14 hp at 4500 rpm. 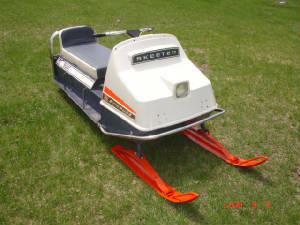 Top speed is 30mph, the oil to gas ratio is 16:1 and the sled measures 107" long x 32" wide with a track width of 20". 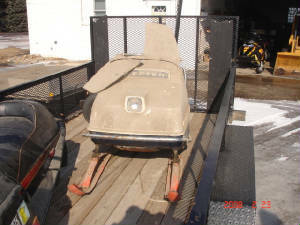 In 1966 the OMC Snow Cruiser was far advanced than most with a primer for fuel, low and high sealed beam light, rear tail light, neutral lock out, parking brake, multi leaf front springs and rear storage. 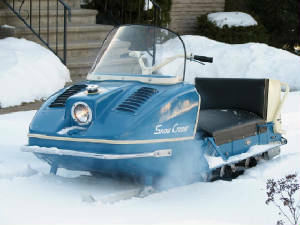 The first Snow Cruiser was made in 1965 and the upgrades were put into effect in 1966 and 1967 with only a color change to the hood in 67. In 1968 the entire design changed. This part of the site is under contruction. Please help us out by submitting what you can.